Ask a friend to take some video footage while you're hitting your driver at the range. When golfers talk about hitting a driver better, they are really talking about achieving more distance and accuracy. Fortunately, there are some tips you can follow to achieve this goal. Take a look at your driver to make sure it is the right one for you and concentrate on your swing, and your driver can become your favorite club in the bag. Check out your driver to see if it is the right length and if it is designed to help golfers at your level. If you are a high handicapper with a slower swing speed, a larger and more lofted club face with a more flexible shaft can help you on those long tee shots. Choke down on the club a bit if you feel you need more control of the club on the tee. You may sacrifice up to 10 yards of distance, but you will be able to grip the club confidently to make a more accurate shot. Go through a pre-shot routine to focus your mind on the shot. Check your grip to make sure the club is lying between the first and second joint of your index finger back to the base of your pinkie. Look at the position of the ball to be sure it is off the inside of your front foot. Your feet should be as wide as your shoulders. Square your club and body to the target. Take the club back with more left arm than right, and make a complete shoulder turn until your arms are parallel with the ground and your wrists are cocked. You might want to try a shorter backswing for more control. Generate power from your body, not your arms, as you uncoil through the downswing. Your weight will shift to the left on the downswing. 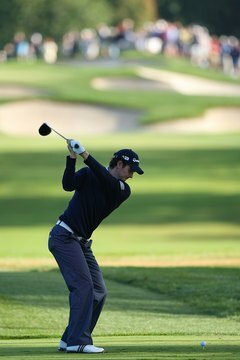 Follow through strongly as you hit through the ball by turning your back to the target with your left foot down and your right heel up. Your arms and shoulders should be relaxed, and your arms should be extended fully as you make impact with the ball. Limit your up-and-down and side-to-side motion throughout the swing, and make sure your hands, arms, shoulders and core work together smoothly for an effective drive.